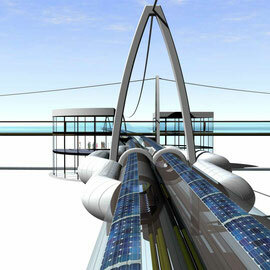 In order to preserve the fossil precious resources for the future, the development study TubeWay-solar for transport and transport is an excellent option. In order to keep the energy priority in their own hands, the OPEC participants should realize this type of pipeline transport network, in concerted cooperation and in their own direction. Because with TW in their hands, as an second portfolio, they dictate the energy question in the direction of the freer world and the preservation of our Earth climate. It is only then that regional oil fields do not necessarily compete and maintain value and price. In this sense, I ask you to forward the link TubeWay to your members. ... with the commitment to future-oriented technical solutions in the field of transport, public transport and buildings - with solar thin film foils. For further information, please visit >> www.tubewaysolar.at. Stability is central to everything we do. It is the overarching concern that connects us all. At the same time, we find ourselves in dynamic systems, which leave us only a few possibilities for countercontrol. Recognizing this dangerous situation and correcting the old tracks by means of new tactics is the order of the day. In order to preserve sufficient energy and resources to return from this impasse, we need special, different means of resource-saving construction technology, and new ones transport and means of transport, along with all kinds of new techniques. I have therefore developed solar mobility approaches since 2002, which are able to cope with this path with quality of life. Please take a look at the patent-free development studies in >> www.tubewaysolar.at. For some 200 years, many technical developments, purely monetary and economic-political interests, soulless industries and god afar science applications have been tempting us into dangerous mazes. However, we owe our grandchildren and the extreme climate more than economic dictates. We can preserve the creation or degenerate in mutual material and market competition. Unfortunately, my technically extended transmission to several manufacturers has not caused any conversion. Therefore, this call is now being sent to you, with the request for an active forwarding to the media, group days, Capitals, EU, and whoever appears to you to be responsible. Precisely because of a narrow commodity forecast, we must finally, especially in the construction sector, give in to new possibilities. Please see more in > www.tubewaysolar.at. These patent-free inventions needs and expect their industrial implementation - this is my strong vision. Wath can protect us from the consequences of our own, dynamic threats? With 8 billion inhabitants, despite high technical possibilities, air, water and raw materials are scarce. The economic model of competition is becoming increasingly absurd and would drive us into blind exploitation and new devastating wars. But in mutually honest recognition as "a humanity" also arises the necessary power of wise actions, and the error of dangerous competitive thinking can still be translated into ethically fruitful achievements. The economic hierarchy of high finance, nuclear and armaments interests, OPEC power, and the automotive industry - by summit decisions on CO² reduction - is meeting a long-needed paradigm shift. Let's encourage these core areas !! Where water, air and fertile soil undergo such adverse changes, the entire life is threatened! Also new moral problems; and that stable interpersonal relationships and those to decrease our creator, is added. The family and the respect for life lose strength and terrain. It takes mine, your - ours - turn!